Nashville has some great lakes - Radnor Lake, Old Hickory, and Percy Priest are really beautiful bodies of water that make our city unique and offer recreational opportunities of many sorts. Recreational Painting is one of them! Paint this gorgeous sunset and imagine that you're relaxing at one of our terrific parks with a bottle of your favorite beverage, your best friend, and a paintbrush. It's pretty close to the experience you can have at our studio tonight! You'll learn some great techniques with this painting and you'll find out that you're a better artist than you thought! 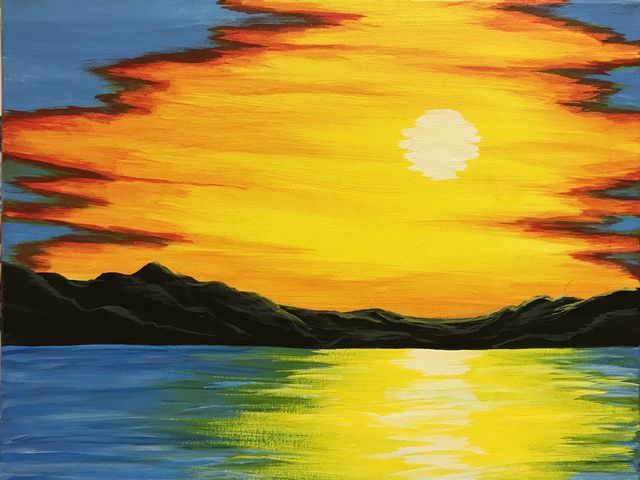 Blending sky and water is fun and our instructor will help you understand color mixing, brushstroke techniques, blending and more to help you discover your inner artist while you enjoy the company of new friends and old ones in our bright, contemporary downtown Nashville studio. Bring a bottle of your favorite beverage, a friend or two, and get ready for a fun time painting! This painting is suitable for painters of any skill level. And as always at Dabble Studio, WE STENCIL THE MAIN LINES OF THE DESIGN ON THE CANVAS FOR YOU BEFORE CLASS! Plan on 2-1/2 to 3 hours, and feel free to arrive up to 30 minutes early to choose your seat, meet up with friends, or enjoy a drink. A selection of wines by the bottle, beers, and moscato by the glass, soft drinks, and bottled water available for purchase. No more rushing to get drinks before class! We'll also have available for purchase at the start of class Chef Jamie's delicious house-made pimento cheese and crackers!